Lyon: Global music industry experts are attending an anti-piracy conference at the INTERPOL General Secretariat headquarters to exchange best practice, discuss emerging trends and content protection strategy. Bringing together some 80 representatives from 27 countries, the two-day (18 and 19 March) conference organized by the International Federation of the Phonographic Industry (IFPI) will also see participants share case studies. In her opening remarks, IFPI Chief Executive Officer Frances Moore said: “We greatly value our relationship with INTERPOL. For us in the music industry, the objective is to create space for the legal, licensed digital market to grow. If we look back over the last few years we can see that it is a strategy that is working. Welcoming the delegates, INTERPOL Secretary General Jürgen Stock said intellectual property theft was a serious issue affecting all sectors, and that to continue the fight against counterfeiting and trafficking in illicit goods, expertise and skills must be developed not only across borders but also across industries. The anti-piracy conference is the annual seminar organized by IFPI, which represents the recording industry worldwide, for its record company members and affiliated national groups. The meeting is being supported by INTERPOL’s Trafficking in Illicit Goods and Counterfeiting (TIGC) unit, which since 2012 has helped coordinate some 20 operations involving 139 countries resulting in the seizure of fake and illicit goods worth hundreds of millions of US dollars. 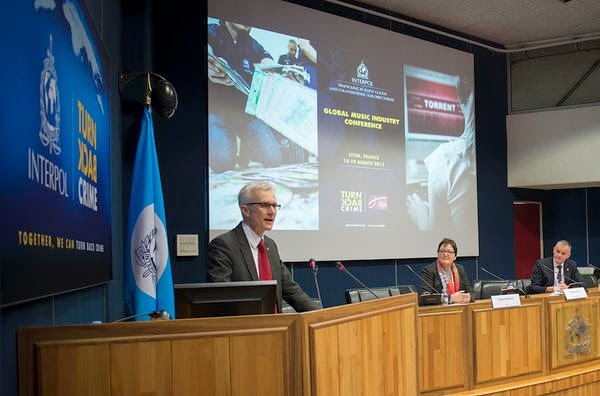 Raising awareness is also an integral part of INTERPOL’s TIGC programme, and through the Turn Back Crime campaign aims to effectively communicate the threats of counterfeiting and illicit trade and its links to organized crime.